How do I stay hydrated? The loss of water while hiking or paddling can impair your performance and potentially lead to a dangerous situation. Proper hydration is vital for everyone. On average, 64 ounces of water a day is considered optimal, but the need increases with exercise as well as other factors like heat and humidity. Choosing the right hydration system to fit your needs is extremely important. Based on your type of activities, you might need more than one type of hydration system. If you are hiking, kayaking, biking, snowshoeing, etc., one hydration system might not fit all your needs due to the amount of water you might need. If the activities are from 2 to 8+ hours, you will need a larger hydration system for the longer amount of activity. A recommended guideline is to drink about 1 liter of water for every hour of exercise. What type of activity are you participating in? Will you be on a flat hike, running, climbing over boulders, walking, kayak touring, day paddles, etc. Based on your comfort level, either a water bottle or a secure hydration system will be necessary. The less stable the activity is, the more secure the hydration system has to be. Single or multiple bottles can be carried in a hip pack or back pack or behind your seat while paddling. There are insulated water bottles that water can be frozen inside (1/3 of the bottle) and the water inside will remain cold for the whole day (for day hikes or paddles). But if you are planning on hiking or paddling all day, 2 water bottles will not be enough water for you and a hydration pack should be considered. 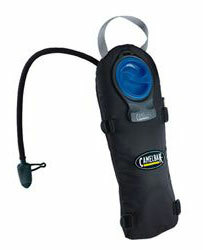 Hydration packs come in multiple sizes and allow you to drink water while you are on the go. A long tube is attached to a bladder with a bite valve to allow you to drink water. The bladders, when empty, take up very little amount of space. The hydration pack can accommodate interchangeable, sized bladders for different types of your activities. There are different types of openings on the bladders: wide fill-mouths and zippered bladders. The hydration pack keeps your liquids either hot or cold. Choose your size and shape carefully base on your type of activity. Comfort is the key to every hydration pack. If the hydration pack is not comfortable, it is not the pack for you. Try on as many hydration packs as necessary. Don't purchase the 100 ounce bladder because you might need it one time. Purchase the size that you will need most of the time. Every gallon of water is approximately another 8 pounds to carry. Don't forget to learn how to maintain your hydration system correctly because incorrect methods might damage your hydration system and choose your hydration system wisely.